It’s Husbands Jim but not as we know it. Yes Cheeks and Brady, still married, still in love and still damn near hilarious, are back, but this time they’ve swapped their riotously colourful 3D world for the every bit as imaginative 2D world of the comics. 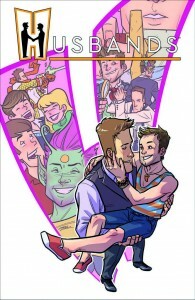 In a series of six comics titled “Drawn In” from Dark Horse Digital, which capture the look and feel of the sitcom but also add a whole other dimension to the tale, everyone’s favourite accidental gay twosome embark on a whole new series of adventures, with Cheeks’ bestie Haley along for what can only be described as an Alice in Wonderland-esque ride. Sucked into a comic they’re given as a wedding present, and stripped of their memories, but not their wit or personalities (which means Cheeks is well, as cheeky and irreverent as ever, with Brady doing his best keep up with him), they must find their way back home … while they still can. It’s a whole new world for Cheeks and Brady but the humour is as sharp and hilarious as ever! 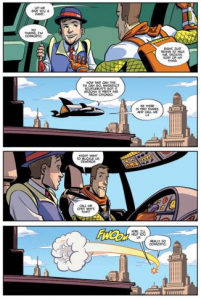 Along the way, according to GLADD, they will be involved in “a superhero showdown, fairytale fantasy, an outer space battle, high school comedy, a noir mystery, and a secret-spy thrill ride”. That’s quite a list and gives you a sense of just how much of their considerable creative talent Jane Espenson and Brad Bell who created and wrote the series, and now the comics, have poured into this endeavour. While the comics are only available in digital form at the moment, they will be released in a beautiful hardcover bound edition in March 2013.